Lambert Hillyer's Dracula's Daughter - the sequel to Tod Browning's 1931 classic Dracula - has long been considered an inferior follow-up and a forgettable film by many horror fans and critics, despite the fact that it is one of the best Universal sequels and horror tales of the period. Following an iconic and legendary film such as Dracula is never an easy task, for any director in any time, but Hillyer and crew manage to pull it off with some strong acting, fast paced and more linear camera-work, and an interesting plot centered around a main character that we both loathe and empathize with. The result is an atmospheric and entertaining film that works well as both a sequel and as its own stand alone feature, one that is certainly worth a look by any fan of Universal's monster classics of the 1930s and 1940s. Cinematographer George Robinson (a Universal regular and film veteran since the silent era) makes no attempt to emulate the intricate camera style of Dracula cinematographer Karl Freund, instead using his own economically simple sensibilities to show us the story. While Freund's style is unquestionably the more realized, Robinson's approach works well as a calculated counterpoint to it. Where Freund used intricately staged moving camera shots to add a larger feel to his set pieces, Robinson uses tighter shots and more calculated symmetry between the actors and objects in the background and foreground to give us a sense of claustrophobic intimacy with the situation we are seeing unfold. The result is that we feel more involved in the action, as opposed to just viewing it from afar in an interesting way. In effect, it allows the film to have an independent visual identity from its predecessor. When we re-visit familiar environments, like Castle Dracula, we see it through a new set of eyes that make it feel somehow familiar and new at the same time. While Freund's style is still superior, Robinson brings a visual sensibility of his own that keeps things fresh and engaging. Star Otto Kruger is suitably convincing as a man of science and logic who is forced into a situation where logic does not apply. Although he does score points for believability, his character is too flat and unexciting for a lead. As Kruger's Garth is basically the masculine version of a "damsel in distress", it is somewhat problematic when you find yourself a little indifferent as to his character and his fate. Kruger does a fair job and he seems likable enough, yet in this role he just doesn't capture the interest necessary to make him a strong main character in the film. Gloria Holden, playing the title role, is quite good. While Lugosi's count was a fiend that showed little human emotion, Holden's Countess is a sympathetic, damaged woman locked in inner turmoil who is ultimately very confused on every level - she seductively attacks both men and women, she lets her side-kick effectively take charge of her in most situations (the complete opposite of Dracula's relationship to Renfield) and in the end can't even decide whether she is truly good or evil. While the Countess is certainly the main villain of the story, she is also the victim - of both Dracula (vampirism) and Sandor (manipulation) - and she plays both sides of her character surprisingly well. Nonetheless, while Holden can certainly hold an imposing stare and evoke a certain quality that reminds you of Dracula, she is at her best when mourning her woeful existence. Without Holden's ability to emote the proper feeling, this film would not have worked at all. Screenwriter Garrett Fort’s dialogue is well written and rarely falls into terribly campy territory, particularly in the strange battle of wits that evolves throughout the film between Sandor and the Countess as he rallies for her to give in to her darker desires. These brief moments of dialogue do much to flesh out the inner motivations of both characters while also adding a touch of atmosphere that mere visuals could not reach alone. When the Countess tries to argue against Sandor's pessimistic view of what she is, she asks him to “...look into my eyes, tell me what you see!” Sandor ‘s answer is simply “Death.” Short and simple as it may be, this assessment is chilling and speaks volumes about both characters. Moments like these add much to the film and its effectiveness would be greatly diminished without them. 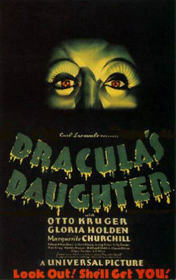 Dracula’s Daughter stands as an early example of Hollywood's time-tested sequel methodology - take what worked in the first film to a new level – “bigger is better.” This time we are given a villain with more dimension, plane rides instead of boat rides, a few good looks at Dracula's staked corpse (even if it is an obvious dummy) instead of the few sound effects and moans heard at the end of Dracula. The end result is that the film feels more contemporary and closer to the world we live in than its predecessor, bringing the horror closer to home. The problem is that following that "bigger is better" credo sometimes causes unnecessary and inexcusable discrepancies between sequel and original. For example, if Garth travels the countryside by car and to Transylvania by plane, then why did Renfield take a horse-drawn carriage to Borgo Pass and later he and Dracula leave for England on a rustic looking boat? The filmmakers’ intentions may have been the best, but the "modern" touches in Dracula’s Daughter diminish continuity between films and leave the overall impression that there should have been years in between this film and Dracula instead of mere moments. Dracula's Daughter is an entertaining film and a worthy sequel to Dracula, in spite of its reputation as a forgettable film in some circles. Certainly it has its issues, but what Universal classic doesn't? Dracula's Daughter has the dark atmosphere, sympathetic monster and compelling characters that became staples of the studio's best genre work, along with an interesting plot and some truly great acting... what's not to like? The next time you feel like getting lost in the dark fantasy of Universal's classic horror sequels, but can't bring yourself to give Frankenstein meets the Wolf Man or Bride of Frankenstein their 28,000th spin in your DVD player, give Dracula's Daughter a chance. You may be pleasantly surprised. Submitted by Jim Hammond (not verified) on Thu, 2009-11-12 08:51. Good review of the film. One point you briefly touched on, Holden's seductive qualities seducing men and women provides an early, if not first, glimpse of lesbianism wrapped within the vampire themes. I suspect this film was an influence on later films that made this an explicit point.